It’s always a hectic task to find the password of your connected WIFI network. On PC/Laptop, it’s pretty much straight forward, but when it comes to Mobile device, things become a bit complex. This can be certainly helpful in moments when you are in an emergency to get connected to Wi-Fi on your Android or iOS device. Unfortunately, you might not have memorized your Wi-Fi password, in such a case, how could you find out Wi-Fi password on your Android or iOS devices for using it on some other devices? Most of the cases, you may forget your Wi-Fi network password on your long-time used Android or iOS as you’ve saved a huge number of different WiFi networks on your device. It is highly convenient to connect to all these networks automatically, but how could you connect Wi-Fi network to some other device like Tablet or Laptop the first time to one of these networks? If it is a laptop or a PC, it is easy to find out the saved password. It is pretty much arduous to view your saved Wi-Fi password on your Android or iOS device. Probably, you’re stuck with your Android phone to browse the web. Here is a complete tutorial that helps you on how to find out Wi-Fi password on your Android or iOS device. How to View Wi-Fi Password on Android or iOS Device? Wi-Fi password is highly essential these days as the current generation is wholly depending on the internet for managing out all the day-to-day activities. It is very essential to make it clear that the process only works on rooted and jailbroken Android and iOS devices respectively. Usually, the information regarding the Wi-Fi password will be stored in the system folder of the device that can be accessed only by the admin. Here is a simple and straightforward process through which you’ll be able to retrieve all the saved Wi-Fi passwords from your rooted Android and jailbroken iOS device. In order to retrieve your saved wifi password from your android device, you need to access the root files of your Android system data. For obtaining access to the root files of your Android system data, you need to have a file explorer installed on your system. Step1: Make sure you have rooted your Android device. If you’ve not yet rooted your device, here is a detailed procedure on how to root Android device without the need of PC or Laptop. Step 2: You need to unwrap a system file on Android, but it is not possible to use the traditional file explorer that comes pre-installed on the device. So, we need to use other File Explorer for this task. 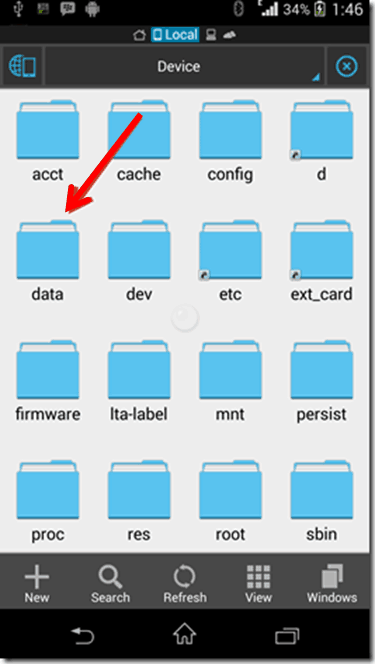 It is advisable to use ES File Explorer for unwrapping a system file on Android. Step 3: Install ES File Explorer App on your Android from Google Play Store. Open up ES File Explorer that you’ve downloaded on your Android device. 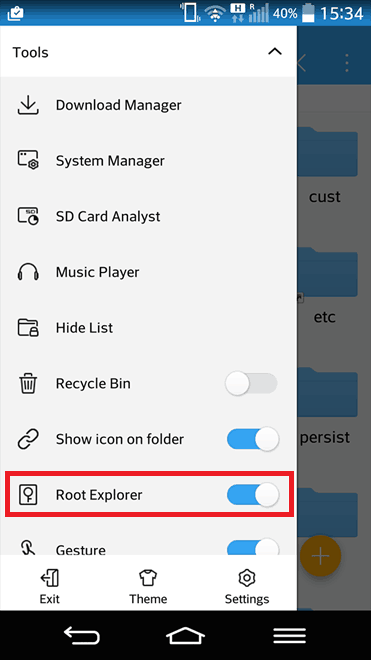 Step 4: Now, you need to enable the ‘Root Explorer’ feature in the app. Simply move to the root folder in ES File Explorer where you need to scroll down to “Root Explorer” under the drop-down “Tools” and enable it. You can find a directory called data. Step 6: Under the wifi folder, you will find a file with name as wpa_supplicant.conf. Select the file and open it with any of your editors. Step 7: Hit the file icon to open it and make sure you use ES File Explorer‘s built-in text/HTML viewer for the task. In the file, you will be able to see the network SSID and their passwords next to it. Step 8: You can now explore for the SSID (network name) and make a note of the password next to it and close the file. 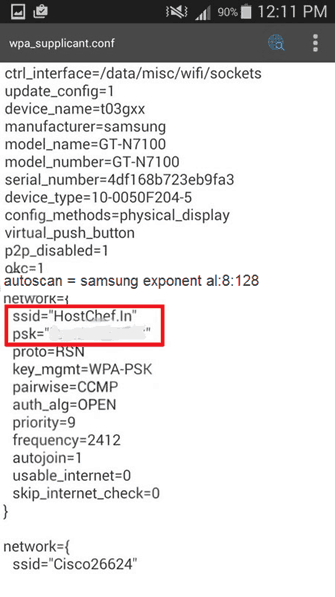 Step 9: Here you need to focus on these following lines and note the values given for psk which reflects your wifi password. Note: Make sure that you do not edit the file or you might start having trouble with your Wi-Fi connectivity. 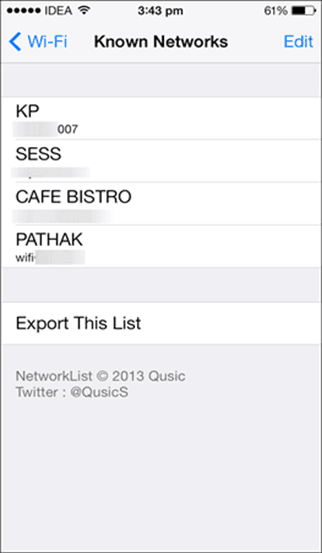 Step 1: Initially, you need to Install a nifty tweak called Network list from Cydia store. Step 2: Download and install it on your Apple iOS device. Step 3: Once you complete the installation process, simply go to your Wi-Fi settings on your device. Step 4: There, you will find a new option as ‘Network passwords’ or ‘Known passwords’ based on your Apple iOS version. 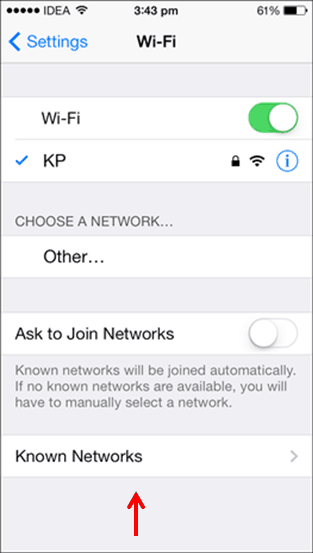 Step 5: If you are using Apple device that runs iOS 7, then it will show as Known Networks. Step 6: Simply tap on the option and you will be able to view all the Wi-Fi passwords that are stored on your Apple iOS device. Step 7: You will get a list of available networks along with the passwords. But, you don’t have the permission to select and copy all those passwords on your Notepad. Step 8: You need to use the standard system of a pen and a paper to write it down. If you’re capable enough, you can even memorize it. Step 9: That’s it. This is the simple process to retrieve Wi-Fi password on your iOS device. Hope you have understood the complete process on how to retrieve or view saved Wi-Fi passwords on Android or Apple iOS device. From now, you need not worry about the Wi-Fi password even if you don’t have your PC or Laptop for viewing the Wi-Fi password. Enjoy browsing the web on your Android or iOS device with your retrieved Wi-Fi password! with rooted android mobile u can easily download wps connect frm playstore and find ur saved wifi password,we want to learn how to find password without rooted. thanks for sharing information about how to retrieve lost password on different WI-FI devices. your article is very insetting and useful to every smart phone. This is really an interesting article. I will try it on my android devices. I hope it will be ok. Can you tell me how to protect my Wifi password from being hacked? Thanks for sharing. I did not use this steps. even in my phone also i have to check have like this option but i cant get anything and ll get worry and ll leave from process. again i ll do forget password options. its some time get crash some files and may not open. now i got wonderful idea from your blog. we can also get wifi password by accessing router via mobile whenever we are connected to that wifi. This is actually a fascinating article.